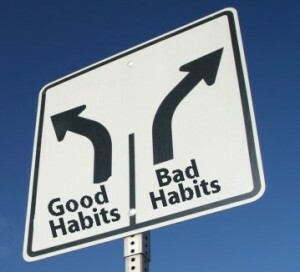 We all know that great swimmers have very few bad habits. And this makes sense, as bad habits in practice become mistakes in competition, and great swimmers don’t make a lot of mistakes in competition. On the flip side, poor swimmers often make uncountable numbers of mistakes. So I’m going to focus here on the bad habits of many of those swimmers in between. The ones who might become great swimmers if only they can shed a few bad habits. While many good swimmers have great intensity in their swimming, turns are seldom performed to the same level. In fact, it often seems that turns are considered to provide a bit of a break before the next length of swimming. This is unfortunate, as it’s incredibly hard and incredibly tiring to make up ground lost with a bad turn. As my university coach used to say, great turns are the easiest way to get faster. So many good swimmers have only 2 speeds: Fast, and Not Fast. And Not Fast is a nebulous speed that can encompass anything between slow technique work, and 200 race pace efforts. When I ask these swimmers to do a Descending set (aka Build, Progressive, etc) the repeat times usually resemble a lock combination more than a downward ramp. And technique work is often done at speeds that rival performance sets. Knowing your speed is extremely important in races that require strategy. Taking out an 800 a few seconds too fast at the 100 split can be a killer later in the race. Learn to gauge how fast you’re swimming. Great swimmers can usually swim repeats to within a second of their goal time. Everybody seems to know about hydration. And those who don’t are usually underperforming or are plagued by constant cramping. But nutrition is a different matter. As advanced and knowledgeable as we are about training, energy systems, stroke mechanics, etc, the swimming community in general is surprisingly bad at handling nutrition, let alone nutrition during training or competition. Nutrition is the fuel for our body to perform, recover and repair. It’s like the gas AND the mechanic for our car. So many times I’ve seen a swimmer struggle in practice, and then found out that they forgot to eat breakfast, or hadn’t eaten anything in the 4 hours before practice. Proper meal planning should be carried out. Protein and dextrose formulas should be used during practice and after practice. Scientifically-based carb loading may be done before competitions. The best swimmers I know can handle training distractions incredibly well. We’re talking about distractions like being tackled by a teammate in the middle of a repeat, and then swimming hard to catch up and pass them. These swimmers don’t need perfect conditions to improve. They just need water. Too many swimmers use training distractions as an excuse to ease off. Somebody gets in the way, or a teammate eases off, or a teammate crushes you on a repeat. Those are all things that can throw a swimmer off their game. Dig down and don’t let it get in your way. I’m not talking here about the easy kind of discipline – the kind that gets you to practice and keeps you training hard. I’m talking about the really hard kind of discipline. Like organizing your time so you don’t have to stay up late studying for that test. Or putting away the video games when it’s time to go to bed, even though all your friends are still up playing. Or skipping a practice when you’re starting to feel sick and know that your body really needs the rest. Great swimmers manage their time and listen to their bodies. Good swimmers often just work hard in the pool. Rid yourselves of these 5 bad habits and you’ll be well on your way to becoming a great swimmer. Dng kemajuan teknology sekarang ini, faktor yg dominan mengganggu konsentrasi & kurangnya istirahat mereka dng adanya pergaulan mereka menggunakan komunikasi gadget, sehingga membuat mereka malas, terutama peralihan usia 10 – 13 th. I would agree that modern communications makes some kids distracted and lazy. Yet, some swimmers manage to put swimming as their priority and focus, while others do not. Perhaps its the fault of coaches, perhaps parents. But ultimately its up to the swimmer. Great post… I can remember many a swimmer back in the day who let their good habits slip as the practice went on. Lane ropes getting pulled, 3-pulls into the walls on kick sets, head up glide from 3m out into the finish… Perhaps what most swimmers never realize is how these habits “suddenly” show up when it comes to race time. The way you finish a tough rep in practice is almost always the way you are going to finish a tough race in competition.